Time-Keeping Bell. The bell was recast in 1844. 時報鐘 - Jihosho. 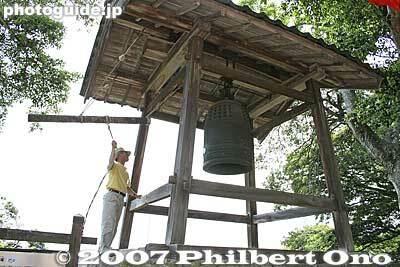 Next to the bell is a tea house called Choshoan. The 13th lord of the castle, Ii Naosuke was a diligent practitioner of the tea ceremony. The famous phrase "Ichigo Ichie" (One Encounter, One Chance) was coined by him in a tea ceremony book titled "Chanoyu Ichie-shu" （茶の湯一会集）.